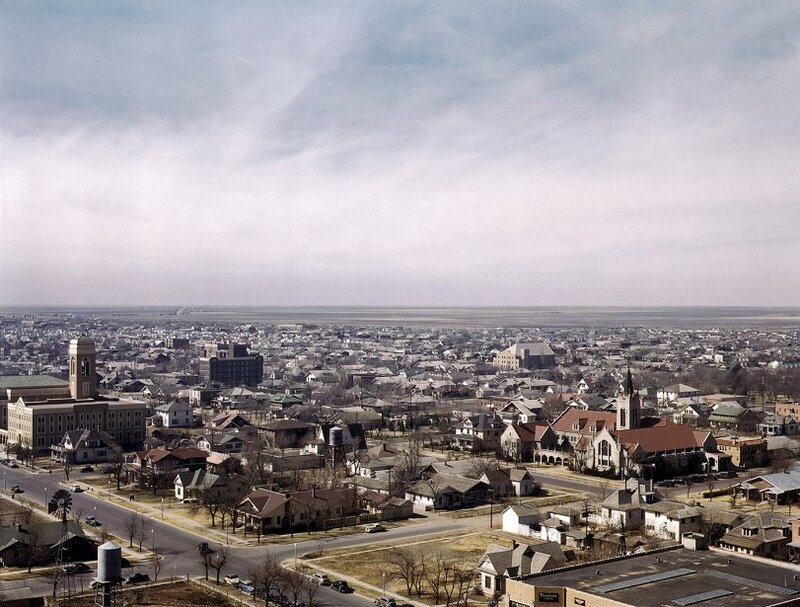 General view of Amarillo, Texas, taken by Jack Delano on his trip via the Santa Fe rails from Chicago to California in March 1943. 4x5 Kodachrome transparency, Office of War Information. View full size | View even larger. The street running left to right is SW 11th Avenue, crossing South Tyler Street. The building with the red tile roof is First Presbyterian Church at 1100 South Harrison. Another 1943 view of the neighborhood and South Tyler street is here. Submitted by Arthur Miller on Thu, 09/27/2007 - 6:43pm. Drew, I am a native of Amarillo. I was baptised in the church and was the first Bell Ringer group. I still go to Christmas Eve Services and take Mom. She is 93. We had the Pinkney Packing Co. business on E. Third. We lived on the west side on Broadmoor. Mom still lives there. We know much about the history of the Panhandle and Amarillo. I live on a ranch in N. Texas that was owned by one of Amarillo's founders. He brought barb wire to the Panhandle and was one of several who chose the site. Submitted by Drew on Fri, 06/29/2007 - 12:15pm. Submitted by Anonymous Tipster on Tue, 06/26/2007 - 4:29pm. If you want to see what the neighborhood looks like today go to Google Maps and search for First Presbyterian Church, Amarillo, TX. The church is still there but not much else. Submitted by Anonymous Tipster on Tue, 06/26/2007 - 3:48pm.